In-class CDMA, Nokia returns to complete its portfolio with the issue of the new series: the Nokia 2608. Phones that have the concept of folding (Clamshell) glamor with this design, offers a choice of color cover, full color. Not only that, the Nokia 2608 also allows a variety of practical functions. A course, easy to connect to a PC via the microUSB port, which can be an internet modem. Meanwhile, internal browsing capabilities including download ringtone and game / mini-applications, this phone has prepared Brew 3.1.5 and WAP 2.0. 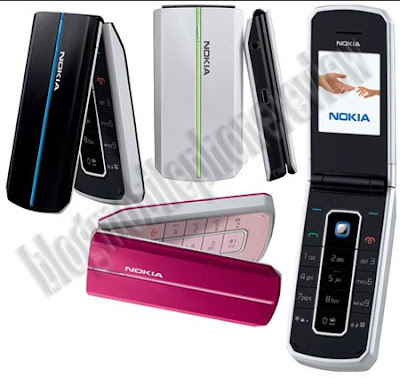 For features, the phone has a CDMA network single band (800MHz) for a stereo FM radio and flashlight. Interestingly, the Nokia 2608 has a LED indicator light will flash and turn on when there is incoming call or SMS. In addition, this phone also features a standard insert another. For example, with voice recording capability up to 90 seconds duration. There is also the flashlight, speakerphone, and several fruit game as entertainment.